The town hall (Rathaus) Wernigerode stands on the southside of the market square. The central timber framed building (Fachwerkbau) was errected in the 15th century. First as a festival house by Count Heinrich in 1420. thenfrom 1494 to 1498 the city errected the imposing timbered building. After a city fire in 1528, when the old town hall burnt down, the city bought an area to the back of the building along the Klint to errect a larger town hall complex. Right of the town hall the alley Klint runs southwards, left of it we see the Marktstrasse. There are several more timber framed buildings around the market square, the most prominent in this panorama is the “Gothische Haus”, which we see on the right side. It was also built around 1494/98 and was a refuge for Melanchthon in the 16th century. It is not named after the architectural style gothic, but instead that word meant medieval or old german once. 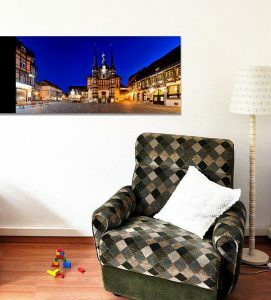 Wernigerode itself was once founded as a protected forest clearance inside the primeval Harz mountain forests and was first mentioned in 1121.